Our last Ofsted inspection was in October 2018 and we were judged to be a ‘good school’ in all areas. Pupils’ achievements in reading, writing and mathematics by the end of key stage 2 are good. Pupils’ progress continues to improve year on year. Parents are overwhelmingly positive about how happy and safe their children are. They praise the care and support that the school provides for their children. Leaders and governors are ambitious for the pupils and provide a good quality of education. Leaders provide pupils with a rich and creative curriculum that underpins teaching and learning. Pupils build their knowledge well across a range of subjects. The quality of pupils’ work in art is particularly impressive. Leadership of the early years is effective. Adults provide precise teaching so that children make good progress from their individual starting points. They are well prepared for Year 1. Rattlesden is an inclusive school which is at the heart of the small, rural village community. Staff develop strong relationships with pupils and their families. Staff use their knowledge of pupils effectively when planning learning. As a result, individual pupils’ needs are well met. 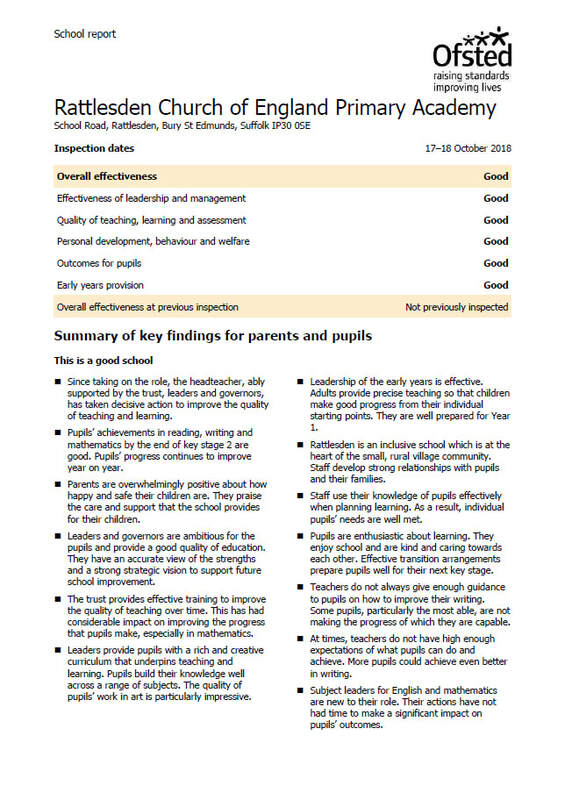 You can read our Ofsted report by clicking here.